Salt Lake Community College’s School of Arts, Communication & New Media presents a conversation with five-time Emmy winner James C. Oliverio on March 16, 2012, at 10:00 a.m. in the Student Event Center on the Taylorsville Redwood Campus. James Oliverio has served as Director of the Digital Worlds Institute at the University of Florida since January 2001. He is internationally known as a creative artist, educator and producer, and is a frequent speaker and consultant to digital media, industry and education programs. The Digital Worlds Institute exists to nurture education between the arts, communications, engineering and the sciences. The Institute promotes creativity across disciplines, classrooms, continents and cultures. Salt Lake Community College’s School of Arts, Communication & New Media presents a conversation with five-time Emmy winner James C. Oliverio on March 16, 2012, at 10:00 a.m. in the Student Event Center on the Taylorsville Redwood Campus. 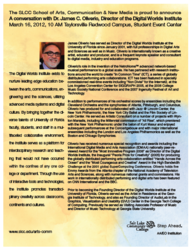 James Oliverio has served as Director of the Digital Worlds Institute at the University of Florida since January 2001, with full professorships in Digital Arts and Sciences as well as in Music. Oliverio is internationally known as a creative artist, educator and producer, and is a frequent keynote speaker and consultant to digital media, industry and education programs. Oliverio’s role in the invention of ‘NetroNome’ technology advanced network-based musical performance to a global scale. He has worked with research institutions around the world to create “In Common Time” (ICT), a series of globally distributed performing arts collaborations. ICT has been featured in specially commissioned real-time events including “Non Divisi” for the Internet2, at the Los Angeles Convention Center for SIGGRAPH 2005, at the 2006 College Music Society National Conference and the 2007 Ingenuity Festival of Art and Technology. In addition to performances of his orchestral scores by ensembles including the Cleveland Orchestra and the symphonies of Atlanta, Pittsburgh, and Columbus, Oliverio has produced for and collaborated with Jazz at Lincoln Center, the New York Philharmonic, the New York City Ballet and the Film Society of Lincoln Center. He served as Artistic Consultant on a number of projects with Wynton Marsalis, including the Millennial commission of “All Rise”, which premiered with the New York Philharmonic and enjoyed subsequent performances at the Concertgebouw and with major international ensembles including the London and Los Angeles Philharmonics as well as the Boston and Chicago Symphonies. Oliverio has received numerous special recognition and awards including the International Digital Media and Arts Association (IDMAA) nationally peer-reviewed Award for the “Most Innovative Program 2008” as Director of the Digital Worlds Institute, the Inaugural “Peoria Prize for Creativity” for producing the globally distributed performing arts collaboration entitled “Hands Across the Ocean” and the “Most Courageous and Creative” Award in the High Bandwidth Challenge at the 2001 global SuperComputing Conference. Oliverio holds five Emmy Awards from the Atlanta chapter of the National Academy of Television Arts and Sciences, along with numerous national grants and commissions. His work in internationally distributed performing and digital arts has been featured on CNN International and the BBC. Prior to becoming the Founding Director of the Digital Worlds Institute at the University of Florida, Oliverio served as the Artist in Residence at the Georgia Institute of Technology, and also as Founding Director of AudioLab in the Graphics, Visualization and Usability (GVU) Center in the Georgia Tech College of Computing. Previously he served as Visiting Associate Professor of Music and Director of Music Technology at Georgia State University. About the College: Salt Lake Community College is an accredited, student-focused, urban college meeting the diverse needs of the Salt Lake community. Educating and training more than 62,000 people each year, the College is the largest institution of higher education in Utah. The College has 13 sites, an eCampus, and nearly 1,000 continuing education sites located throughout the Salt Lake valley. Courses are offered during both traditional and accelerated semesters, during the daytime, evenings, and weekends. Personal attention from an excellent faculty is paramount at the College, which maintains a student-to-teacher ratio of less than 20 to 1.